Please choose any of the links below to view the Gold Leaf Company's wide selection of gold leaf accessories. 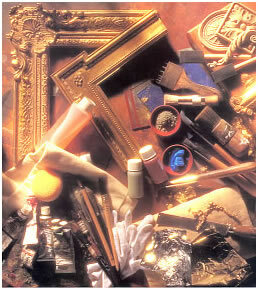 Size is a type of glue with adhesive qualities for the application of gold leaf. For indoor and out door use! The DUX formula for gold size, both Quick-Dry and Slow-Set, have been all-time gilder's favorites for over 50 years. Quick-Dry will reach tack in 1 to 3 hours and Slow-Set will be ready to accept leaf overnight or in 10 to 12 hours. Oil based. 1 gal. covers 400 Sq. feet. 1 qt. covers 100 Sq. feet. DUX BURNISH SEALERS produce a high quality, smooth surface for gilding. 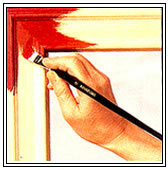 Ochre, red or grey can produce fault hiding bases or color enhancing undertones. Drives to handle - 1 hour. To recoat - 8 hours. Full cure - 24 hours. 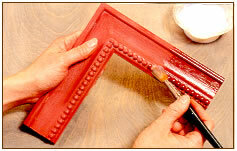 Do not apply over latex or waterborne paints. Brush, roller or spray application. Ground shipment only. Oil based. Red or ochre primer is great for gold. Grey primer is good for aluminum leaf. Oil based. 1 Quart covers 125 Square Feet. This is the traditional, clear, natural, oil based size made in France. LeFranc has earned the reputation of being the best oil size available and experienced gilders request LeFranc for their most important projects. Both the 3 hour fast dry and 12 hour slow set mixtures are available in a range of sizes. Ground shipment only. Oil based. The NEW 12 HOUR No-Lead SIZE has a new formula replacing the traditional 12 hour gilding size used widely by gilders. Preliminary reports indicate 12 Hour no-lead will reach a gilding tack overnight. A domestic, water based synthetic size for use on all interior gilding projects. Reaches tack in 15 minutes with an open time for gilding of up to 36 hours. 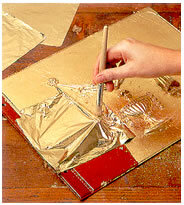 A gilder's tip is a thin, flat brush used for laying loose gold leaf and picking up loose Goldleaf. Shellac flakes are used to seal imitation leaf from tarnishing. Sold in the raw form. Denatured alcohol must be added (not included). 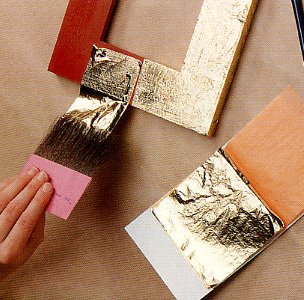 Blond is one of the best shellacs to put over imitation gold leaf! The high quality glue that produces a super burnish. Easy to prepare, this natural glue makes a glue equal in strength to traditional rabbit skin glue, listed below. For mixing instructions, ask for the Santa Fe Formula. The darkening liquids for creating shading effects on gold leaf. The finest Florence Rouge(whiting) from Vermont sold in 1, 5, 10, and 20 pound packages for the making of gesso. The pounce bag rouge powder sold in one pound packages. A yellow resin for rinsing shellac sold in one ounce packages. 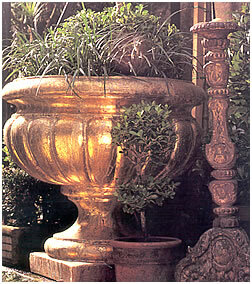 An exceptional gilded surface is a direct result of the application of the finest gilder's bole. Our selection of clays include the prime burnishing clays from Germany, Italy, France and Canada in both dry cone and premixed (dissolved in water) forms. All of these burnishing clays must be mixed with glue before applying. German Selhamin burnishing clays are available in both the dry cone and premixed forms. The dry cone clay is packaged in the two listed sizes. Add the appropriate code to the item number when ordering.